Recently, the wonderful folks at Farm Sanctuary reached out to see if I was interested in highlighting some of the animals that are in need of support. Of course, I wanted to help spread the word in any way that I could. These beautiful animals below are all part of Farm Sanctuary’s Adopt a Farm Animal Program and a sponsorship makes a great last-minute gift for the animal lover in your life (or for yourself). Each sponsorship comes with a personal sponsorship certificate, a color photograph, a decal, and a VIP tour to meet your sponsored animal. The best part is that your gift sponsorship will help provide food, shelter, and care for a rescued cow, sheep, goat, pig, duck, goose, turkey, or chicken. 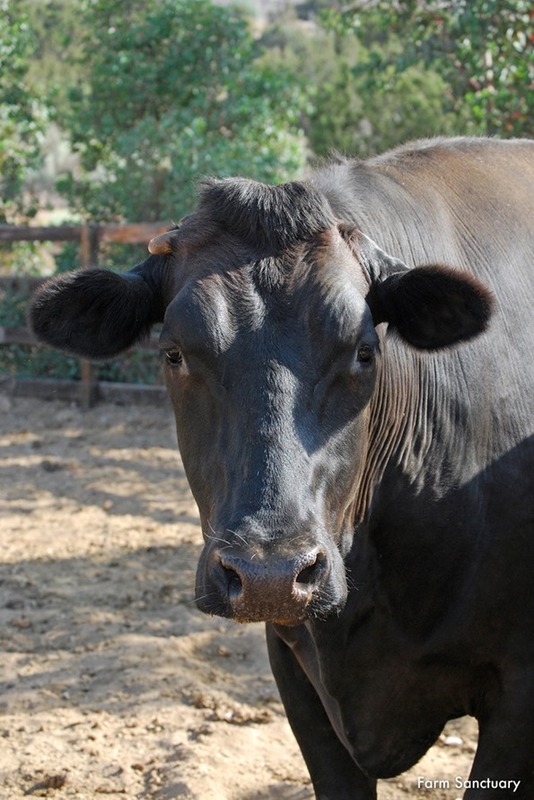 Their stories are told by our kind friends at the Farm Sanctuary. Read on! 1. Ari was born at a “cull sale.” Dairy cows, who produce milk only when they have been impregnated, are subjected to a relentless cycle of gestation, birth, and insemination until their bodies are worn out. At four or five years old, these “spent” cows are brought to auction and sold for cheap beef or used in pet food. When Ari’s mother gave birth in a sale house, workers promptly drove her to the auction floor before she even had a chance to clean her newborn. Ari, only minutes old, was left on the floor to die. Luckily, a kind woman noticed the abandoned calf and immediately reached out to us. We rushed Ari to Cornell University Hospital for Animals to receive vital care, then brought him home to our New York Shelter. Sick and feeble, Ari required constant monitoring and medications at first. As his caregivers watched over him and provided around-the-clock bottle feedings, they were heartened to see his small acts of determination — trying his best at meals, mustering a moo, and attempting a playful dash on his unsteady legs. With lots of heart and lots of help, Ari made it out of the woods and began to thrive. From the moment of his rescue, this sweet boy has lifted the spirits of everyone he has met. Now, his own spirits are free to soar. 2. Spring break of 2013 came early for a certain Cornell University resident. In early March, the Tompkins County SPCA was contacted by the concerned house manager of a fraternity whose members had purchased a baby goat as a mascot. 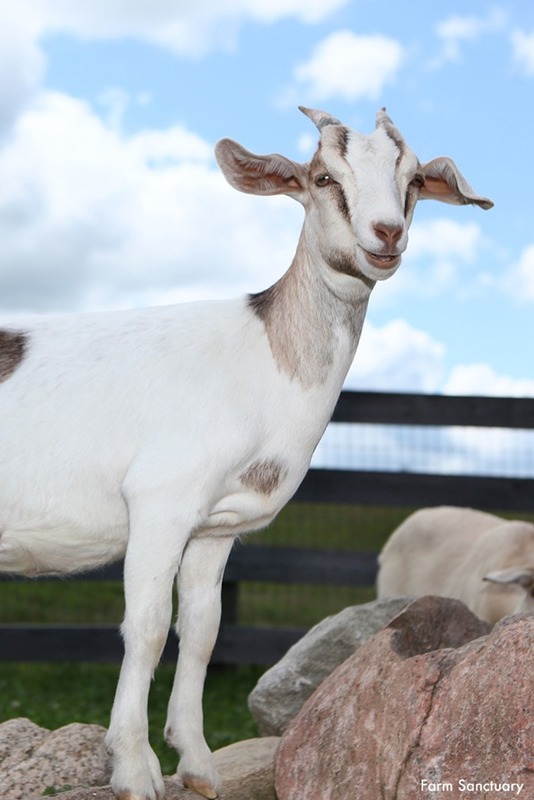 The SPCA picked up the little goat, now named Maxie, and the next morning our team brought her to the greener pastures of our New York Shelter. The life of an animal mascot is typically a lonely one, and this is especially true for herd animals like goats, who are most fulfilled and at ease when surrounded by others of their kind. At our shelter, Maxie will be able to satisfy her curious, playful, and social nature. Forget togas and kegs: This charming party animal has arrived at a true animal house. 3. 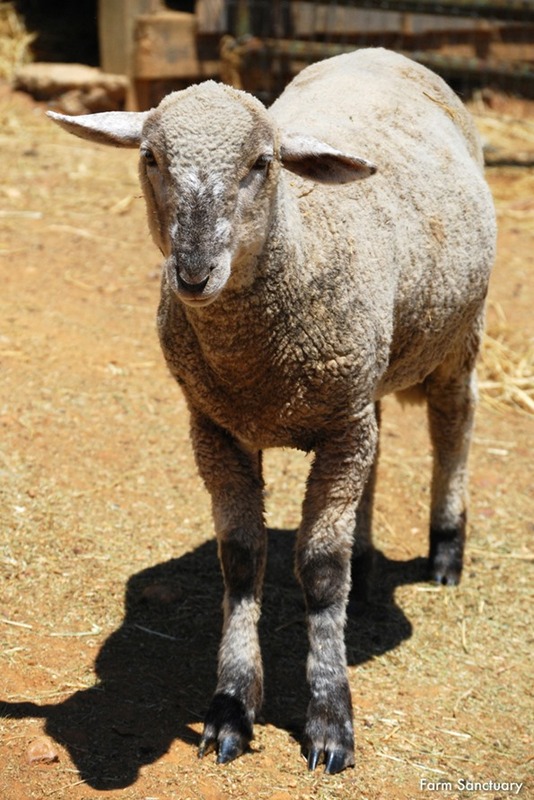 When a man on a hunting trip found Joey by the side of a freeway in autumn 2011, the lamb was suffering from a leg injury and was too weary to raise her head. The hunter was so moved by the sight that he picked her up and brought her home. When, despite his efforts, the skinny lamb continued to languish, he reached out to Farm Sanctuary, and we welcomed little Joey to our Southern California Shelter. With around-the-clock care, we put Joey on the road to recovery—and fell for this curious, affectionate sheep in the process. Thanks to lots of TLC, Joey is now strong and confident enough to enjoy every day of her sanctuary life at our Northern California Shelter, where she now lives. 4. 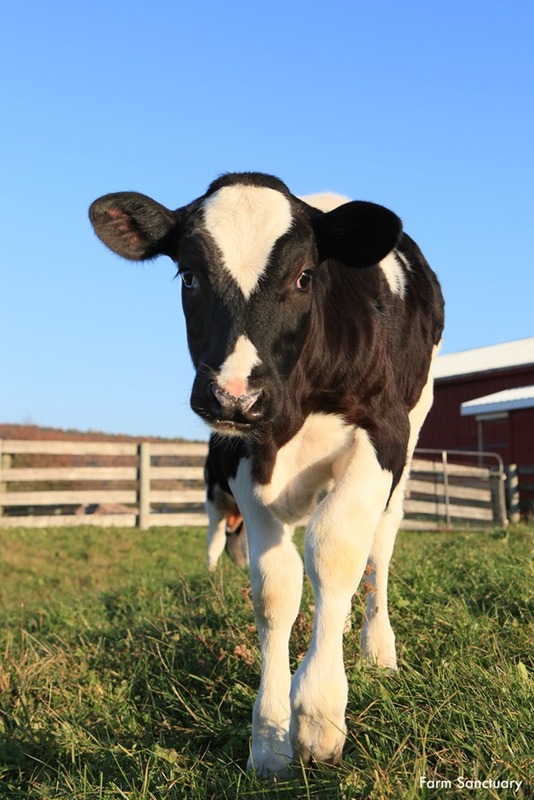 Liza was born at our New York Shelter a mere eight hours after we rescued her mother, Julia, from a factory farm. A breeding sow, Julia had spent months nearly immobilized in a tiny gestation crate with no distraction or relief. As workers moved her from this torturous device to an equally cramped farrowing crate to give birth, they kicked her, beat her, burned her with an electrified prod, and dragged her by her ears. The trauma induced premature labor, and the health of the 16 piglets Julia bore at our shelter was fragile during their first days with us. Now, Liza and her siblings have grown into hardy, happy pigs. Playful and bold, Liza loves people and is best friends with her sister Maggie, leading her on adventures and sleeping by her side every night. 5. 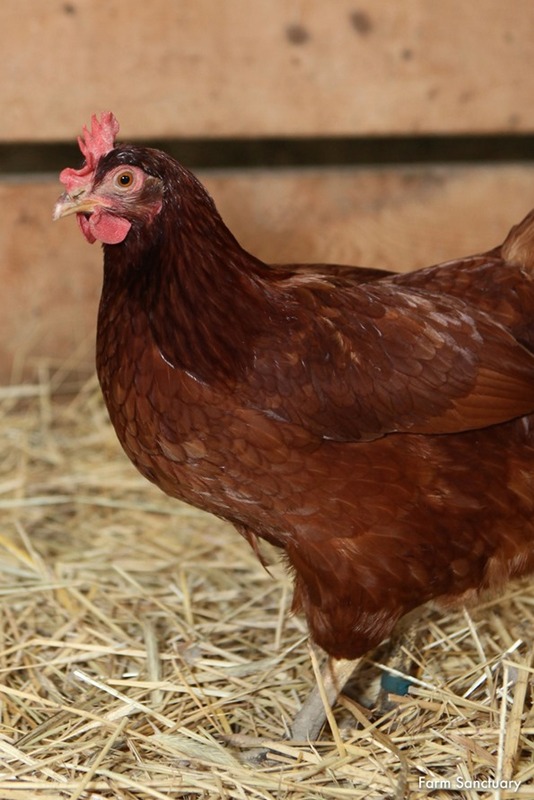 In early January 2013, at a hatchery in Texas, Tammi and more than 100 other day-old chicks were packed into a cardboard box that was supposed to be shipped to Alabama. Due to a label error, however, the box ended up in a Washington, DC, post office, where it sat unclaimed until workers realized something was amiss. The chicks were seized by animal control, and, soon after, our Emergency Rescue Team brought them to our New York Shelter. It isn’t every day that a shipment of animals ends up so far off course, but it is every day that boxes packed with day-old chicks just like Tammi, hatched at facilities of the same sort that supply large egg producers, are sent through the postal service to vendors, farmers, and hobbyists large and small. The chick business is not an alternative to the factory farming industry, it is part of it — and it is characterized by the same cruel practices. Flourishing here at the shelter, Tammi will never again be treated as a disposable commodity but, instead, she will be respected for the bright, curious individual she is. 6. Macy was the subject of a common 4-H project that requires each participant to raise a farm animal. These animals often receive poor care, and, in the case of pigs, they are subjected to ear notching, an industry procedure in which pieces of the ear are cut out, without anesthesia, for identification purposes. To complete the project, the young caregiver must auction the animal for slaughter at a local fair. Luckily for Macy, the young woman responsible for her refused to take the pig to her death and decided instead to find her a loving home. 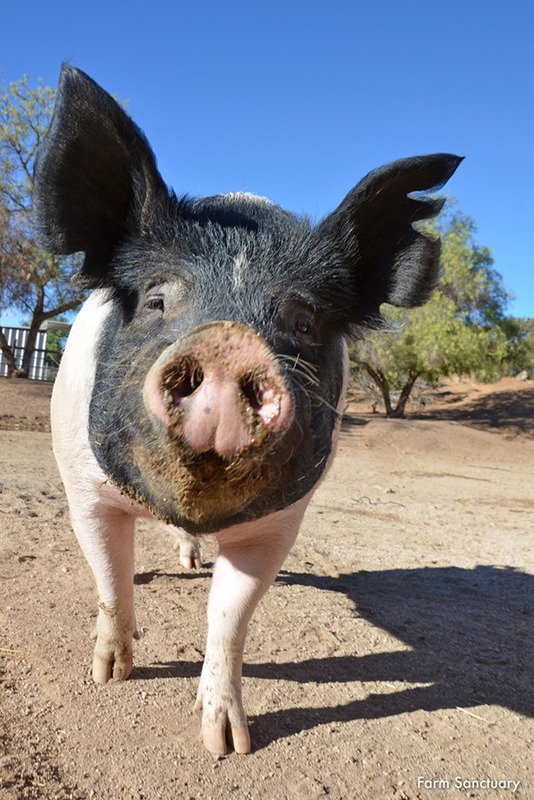 Now safe at our Southern California Shelter, Macy has her own projects to pursue: lounging in the shade, splashing in water tubs and snuggling with her friends in the pig barn. 7. When Mary was a little lamb, a kind woman found her wandering the streets of Los Angeles alone and crying. Loose farm animals are no aberration in Los Angeles and other major metropolises, where many are illegally raised for food in backyards or sold at live markets. Live markets frequently deal in factory farm castoffs and are notorious for keeping their “merchandise” in unsanitary and unsafe conditions. Customers select live animals to be killed and butchered on-site. Mary is now safe forever from such a fate. 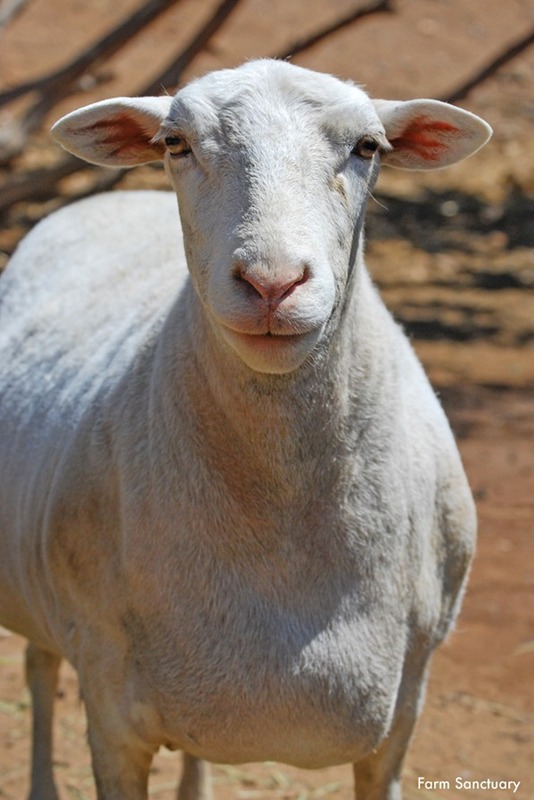 Her rescuer brought her to our Southern California Shelter, and, now, wherever she might find her companions in the sheep flock or human friends ready to shower her with affection, Mary is sure to go. 8. Thatcher joined us thanks to a little boy with a big heart. Walking home one day, nine-year-old Manuel saw some adults dumping a bag of goslings into a yard for a dog to eat. The dog was quickly devouring the tiny birds, but one was close enough to the fence for Manuel to reach. He pulled the gosling to safety, carried the bird home, and spent the next several days diligently caring for his new friend while an adult acquaintance looked for a permanent refuge. 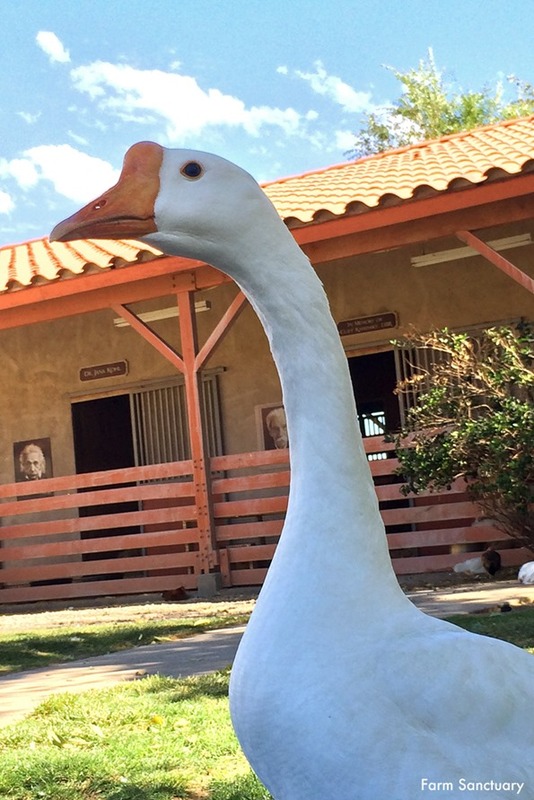 When she contacted us, we gladly agreed to welcome Thatcher to our Southern California Shelter, where the friendly goose has made a splash, bonding with caregivers and discovering the joy of swimming. The kindness of one child gave Thatcher the sort of safe, rich life that most farm animals never experience, and now Thatcher has the power to change lives too, inspiring visitors and readers to let the strength of their own kindness shine through. 9. Gwendolyn is a domestic duck, but she was found loose and unprotected at a public pond. Like rabbits and geese, ducks are commonly purchased as babies by people who are unprepared to care for them as adults. Many later “release” these animals into the wild, mistakenly figuring that they can fend for themselves. Every year we receive numerous calls about such animals abandoned on ponds, where they are ill-equipped to survive. Having imprinted on humans as a duckling, Gwendolyn thought she was one and had no qualms about running right up to people. Luckily, one person she enthusiastically greeted was a wildlife rehabber, who recognized that the duck was in danger and contacted us for help. We were happy to welcome Gwendolyn to our Northern California Shelter, where we slowly convinced her to befriend other ducks. It took a while, but Gwendolyn finally realized that she is not a human but a duck herself. 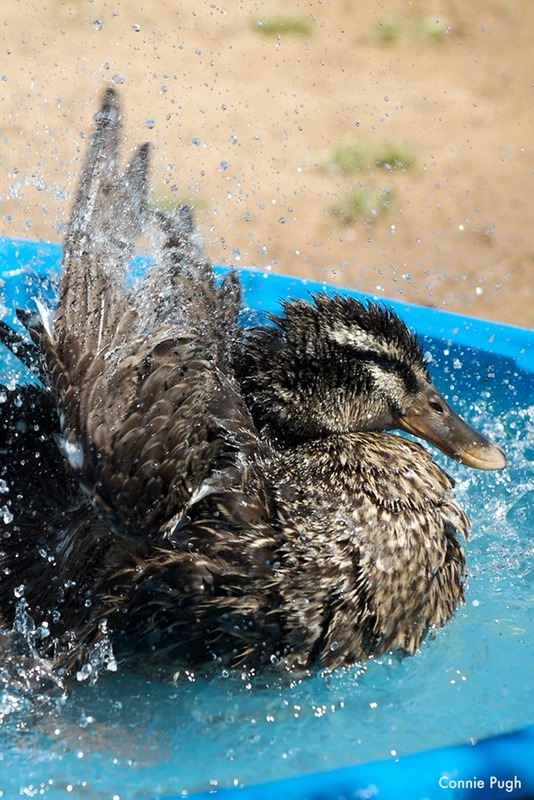 Now she’s living it up in our special-needs flock, happily splashing in her pool all day — though she still takes time to greet her caregivers with a quack whenever they walk by. 10. Cars slammed on their brakes and swerved as Bruno fell out of a transport truck onto a busy Palmdale, California, highway. Miraculously, the young calf survived. After the Highway Patrol gathered him up, Bruno was brought to a county animal shelter. Typically, a calf in this situation would then be turned over to the state branding inspector and sold at auction to be raised and killed for beef. Officers reached out to our Southern California Shelter instead, and we were happy to offer Bruno refuge at our sanctuary. Bruno was born into the dairy industry, which keeps cows producing milk through a relentless cycle of impregnation and birth, but has no need for the male offspring. Had he made it to his original destination, Bruno would have been slaughtered for veal or cheap beef. Fortunately, this outgoing and friendly steer avoided that grim fate. Bruno enjoys the good life here, where he spends his days grooming and socializing with his herd mates, receiving massages from caregivers, and greeting shelter visitors. I couldn’t help but cry reading their stories. The will to survive is so powerful and I think their journey is something many of us can relate to on some level or another. Food, shelter, companionship, and love…that’s all we really need. Compassion and respect for all living creatures. 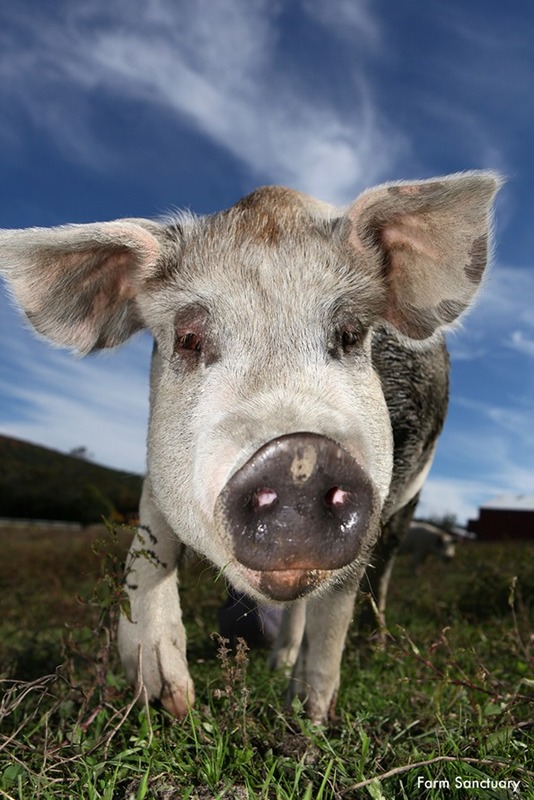 For more info on how you can adopt a farm animal, see here. Or if you’d like to make a donation in someone’s honour, you can do that too. For a list of farm sanctuaries around the world (and quite possibly, near you), see this list. Thanks for reading! See you this weekend for another fun giveaway. Thanks for sharing! I regularly donate to Farm Sanctuary and hope to visit with my family next year. Places like this will hopefully help people see that these are individual living creatures that deserve much more. I loved reading these! Your blog is so popular, so I think it is really wonderful that you are using it not only for cruelty-free recipes but as a platform to speak out about animal rights issues. You have a unique position where you can reach many people at once and plant a seed. Thank you for all that you do! Thanks Amy, I really appreciate that. :) Glad you enjoyed it! I met Ari and Maxie!!!! I met the pigs at the New York shelter also, but I didn’t know which particular individuals I saw. Very sweet animals!!!!! Found out pigs love to eat pumpkins,. I spent a lot of time petting Ari, he’s a real sweetie! Thank you for this post! I’ve been meaning to sponsor for a long time now and this post reminded me to just do it. I can’t wait to go visit! Thank so you so much for sharing this! I just realized I am about an hour and a half away from the new york location. I am going to donate now and can’t wait until its nice enough to go visit in the spring! Seeing this makes me want to me a vegetarian. It is appalling to see how people treat animals. Thank you for sharing that Ange!! A little disappointed by the comment about 4-H animals being treated poorly. I was in 4-H as a kid and everyone in my club treated their animals extremely well – kids are taught to take good care of livestock and learn a lot of valuable skills along the way. I don’t necessary agree with eating meat now, but the 4H program taught me nothing but stewardship for livestock and land. 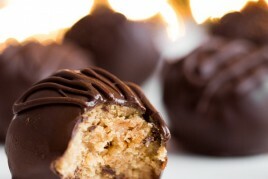 Love your blog Angela; thanks for sharing this program with us. I agree. I’m glad you’re doing this and glad that people’s are aware of the meat industry. Especially in America. I however, have to say that as a farm girl and someone who grew up around 4H all my life and participated in it, I’m offended by the blanket statement that “often” these animals are mistreated. Perhaps statistics is essential when using such a statement. There is a responsibility when calling out an organisation such as 4H to not generalise, sweep and criticise without proper specific numbers to demonstrate such a comment. Keep rockin on for animal rights. Thanks for sharing your thoughts! I don’t know much about 4H, so I can’t add to the discussion, but hopefully Farm Sanctuary can chime in with their perspective. We are grateful to hear that commenters provided outstanding care to their animals during their 4-H participation. Even in such instances, these animals may still be subjected to routine mutilations, such as ear notching or castration without any pain relief. When the program ends, many are sadly trucked to auction, which is a stressful ordeal at best. And the vast majority are then slaughtered in accordance with various industry practices, which are quite inhumane. This is lovely, Farm Sanctuary is great. It still shocks me that people can treat animals this way, no matter how many times I hear these stories. I’m glad these animals have a safe, loving home. Oh my goodness! What lovely little guys! :( It filled my heart with happiness…and sadness, to hear their stories. I adore their photos! Thank you for sharing and caring. Such a great post, so sad what animals go through! Thanks for sharing the stories! This is a lovely post, the stories of the animals are heart wrenching. I will definitely be looking into visiting a Farm Sanctuary near me and donating to them. Instead of getting my brother and his girlfriend a gift for Christmas this year I decided to sponsor an African Grey named Max on their behalf. They volunteer for the bird rescue where he lives and have adopted 4 birds and fostered others. I felt that this would mean more to them than a gift they may never use. What touching stories of beautiful animals, if only all farm animals could feel love and kindness instead of the cruelty of today’s factory farms. I can’t wait to visit Farm Sanctuary’s New York shelter in the next year and see these sweet animals up close, it looks like a great place to visit. Thanks for sharing their stories with us, especially during this week of Christmas. I really wish I could reach out and thank the good people who saved some of these animals – the hunter who saved the lamb!? The little boy and the goose. The state police and the cow. I strongly believe this type of behavior must be acknowledged & rewarded – too many times it is labeled as “sissy” behavior which discourages compassion towards animals, the young, the weak, etc. I am so glad you posted all of these wonderful stories! I went to the New York Farm Sanctuary a little over a year ago now, but seeing these makes me want to donate and go back as soon as possible. Thank you so much for sharing and caring! This is such a sweet and touching post. I am so glad you shared this with us. I became vegan this year and am just now becoming more aware of the impact that choice has on the environment and on these wonderful animals. I will be sure to donate. Thank you again for sharing and happy holidays!! I am disappointed by the 4-H comment. I too raised 4-H animals. I spent hundreds of hours playing with my animals, cuddling them while I read, taking them on walks, making sure they got enough exercise, and giving them special treats. I kept diligent records of their food consumption, as well as records of any medicine or vaccines administered. I loved every single one of my animals, as did other 4-H’ers. In my 8 years in 4-H I saw one person mistreat their animal. They were removed from the fair and I believe they were no longer able to participate in 4-H. Animal abuse is not taken lightly in that community. The ear notching mentioned is no worse than ear piercing that is done all the time with people and animals alike. It’s horrible and eye-opening to read these stories. Thank you for posting this. I never knew about the livestock ‘industry’ that takes place right in the cities.My friend rescues as many sad souls from a nearby auction as she can, heals them, then re-homes them. It keeps her in the poor house, as she spends all her money on this. Oddly enough, there is a local monk community nearby that does the same thing, or so I hear. Bless you for highlighting these beautiful animals and a FANTASTIC charity! These stories are touching, but I just want to say that the story about 4-H animals being poorly treated is absolutely not true. I raised 4-H animals myself, and I could never get to the point where I could sell my animals because I loved them just like any other kid loves their dog. I legitimately spent hours playing with my chickens and ducks in the summer time. And the kids who did sell their animals often spent the entire previous year caring for their animal, including regular bathing, walking, feeding a special diet and training them to show at the fair. They often have a very special bond with their sale animal, and yes, they sell them, but the animals quality of life is vastly superior to that of commercially raised livestock. While I am a vegetarian, and I would love nothing more than for everyone to adopt a meat and cruelty-free lifestyle, I also recognize that the likelihood of that is not high. It’s so important not to villainize the people who ARE raising their animals in an ethical way, even if they are being raised for slaughter. If we ever want to change the mindset of the population in terms of animal welfare, we need to start by realizing everything is not going to change overnight. If there are some people who are giving their animals the best quality of life they can, let’s encourage that instead of condemning them along with the people who beat their livestock, confine them to cages, cut off body parts and slaughter them in unimaginably horrific ways. thank you for sharing this and bringing it to my attention. I now follow farm sanctuary and will make a donation. I am totally aware that you don’t choose your specific advertising, but I hope that you could moderate them in some way it since this has not ever been a politically inclined blog by any means, unless someone counts the content of vegan recipes as radical. As a fellow Canadian and a BC resident I am sad to see an interactive banner on the top of your page for the Northern Gateway Pipeline. Sour grapes and sad faces. the advertisement on the pages has nothing to do with the blog owner. It is internet generated. Mine recently had a 100% pure ad after I spent sometime researching their product. It is related to topic searched on the internet or just general advertisement that the internet search provider generates. Thanks for your comment! You are right that I can’t control every ad that pops up on the blog – managing the ad networks is a tricky one on many counts. For instance, we can’t see ads that run in the US (or elsewhere in the world), for example, so we have to rely on blog readers if they have concerns. That being said, I do remove hundreds (if not thousands) of non-vegan ads each month. You probably wouldn’t be surprised as to how many Burger King and other similar ads dominate the food blogs. Blog readers let me know about these ads if they sneak through and we see some occasionally too even though we have hundreds of non-vegan categories blocked. This results in a huge income loss, but it’s something I care deeply about so I do it. Other ads I will gladly remove are weight loss ads. Sometimes those pop up and I block them. I cannot, however, commit to removing other types of political ads. It’s just too much for my husband and I to stay on top of, so I hope you understand. Cathryn is also right about the ads being generated to your specific location and search history. It’s quite possible that you were reading about the topic beforehand, or simply being in your location makes the ads pop up more often. I know it’s frustrating, but if it continues to happen you can always install an ad blocker and you’ll never see an ad again. 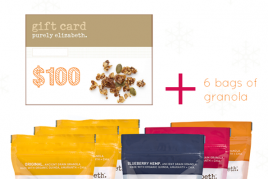 Funny you mentioned 100% pure Cathryn because I was on their site recently to purchase a couple products and then I saw ads from them too (which is fine by me because they are vegan). Anyway, I appreciate your thoughts! Keep them coming. I wish I didn’t have to run ads on the site, I really do, but then I wouldn’t be able to do this full time. Awww such a cute story. I love this idea of adopting a farm animal. Thank you for sharing, I too cried reading these stories. Animals are such amazing and resilient creatures! My mother was in 4-h she told me. it s so great to take care of theses animals and the loving bond with so many values and lessons learned… As many have expressed there opinion I hope you can respect mine… I feel that having a child or teen raise a animal to be sold of course to a slaughter house or private farm in my mind is showing that child that its ok to raise and care for a living been and when your done with it or your programs organization is over you can sale this living been wow isn’t this the first process of desensitizing a child showing its ok to mane and murder that animal when your threw with it . From this childhood lesson you just set your child up to actually show them how cruel the real world is…or instilled characteristics traits that im sure they can use for a lifetime. Ive live on a farm for years and the animals were abused. I mean Government approved and funded. I’m so happy to see you promoting this kind of thing on your blog; a lot of people don’t seem to understand the difference between *being* a vegan, meaning someone who supports and actively promotes things like this, and merely eating a vegan diet. I’m doing a personal vegan challenge for the month of January – I want to eat 80% vegan for the entire month. All of your posts are going to be very helpful, but do you have one in mind you think would be most helpful? I think it’s important that everyone has their own opinions, ideals, and can choose how they eat, but I think it is careless how people assume if one animal suffers on a farm by the hands of one individual then that must mean it’s standard for all farmers and their workers to do the same. Farmers are farmers because they love animals and they care for them. If cows were let loose off the farm they would die of hunger and certainly the young ones would be killed by coyotes and wolves. I think it’s fine if people don’t want to eat meat or animal products, but please stop spreading information how horrible farming is. I don’t eat veal, but I’m not going to slam those farmers or slaughterhouse workers. Do yourself a favour and get in contact with a farmer or talk to one at a farmers market and see how compassionate and caring they are towards their animals. 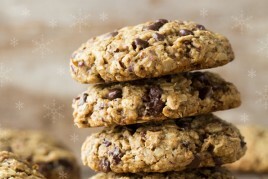 I do enjoy this blog and even though I’m a meat and animal product user, I enjoy many vegan recipes. I just hate to see stories sensationalized without the mention that majority of farmers care and love their animals. These babies look so cute! I love this!! The sanctuary I volunteer at allows you to adopt animals too. There are some pigs that are so stinking spoiled and totally know it. Awww they are so adorable! 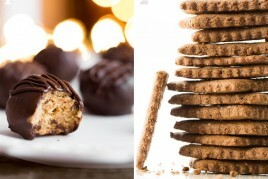 Thank you for sharing such a wonderful article!